If an object does not have a resultant force acting on it, it will travel in a straight line at a constant speed. 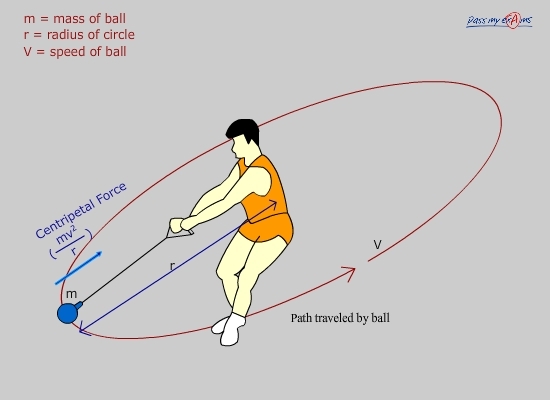 To make it travel in a circle, you need to pull it off course with a force acting towards the centre of the object. The velocity will always be at right angles to this force. This is how the planets are kept in orbit with the force of gravity pulling them around the sun. The force is called a centripetal force, a centre seeking force, because it is pulling the object towards the centre of the circle. If you were on the object, you would feel a Newton III reaction force pushing you out of the circle. This is why water stays in a bucket if you swing it around your head. The force is directly proportional to the mass and the square of the velocity and inversly proportional to the radius. So the force increases with mass and velocity and decreases the further out from the centre of the circle you are.